The Staff of the Malmstrom Inns and Suites have adopted an arctic wolf named Malik. Malik is kept at the International Wolf Institute in Ely Minnesota. This suite is dedicated to her with hopes to keep guests informed and educated about one of our many endangered animals. 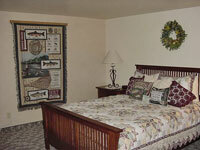 The suite is tastefully decorated in a wolf motif. The Bitterroot Suite is inspired by Montana’s beautiful Bitterroot Valley and decorated with images of that region’s spectacular rivers, mountains and wildlife. The Moose Creek Suite is one of our fancier boutique style suites. 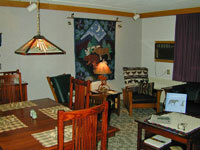 The suite offers a Mission Era Montana lodge décor. This theme has been carried throughout the Inn. Thirty extended stay suites are open for newly arriving PCS in and departing PCS out families. These units feature an in room washer and dryer, Sony play stations, 25-inch color television, electric range with a ceramic top and individually controlled heating and air-conditioning. Half of the units are two-bedroom facilities. Children can stay in a separate bedroom with permanent beds and closets instead of in the living room. 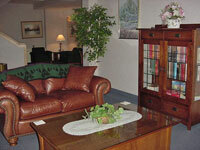 The interior furnishings are new and accentuate the feeling of being home.